Constancy appears to be the theme in the forecast for the next ten days; similar to this week’s weather, we’re in store for another week of mostly sunny days and temperatures in the 20’s with a couple minor chances of snowfall. Interestingly, the temperatures in southern and western Minnesota are cooler than those in the eastern and northern parts of the state; there are currently two fronts, one with cooler air and the other with warmer, meeting in the middle, accounting for this difference. Snow has even begun to melt up on the North Shore of Lake Superior, as cities like Duluth and Grand Marais have seen daily temperatures higher than those in St. Peter during the past week. Remember that rabbit I photographed back in early January (appearing in Arb Sightings 1/7/10) behind the Interpretive Center? Well, he’s been appearing in the exact same spot each afternoon since then, and looks none the worse for wear (although he was a little more camera-shy this time). 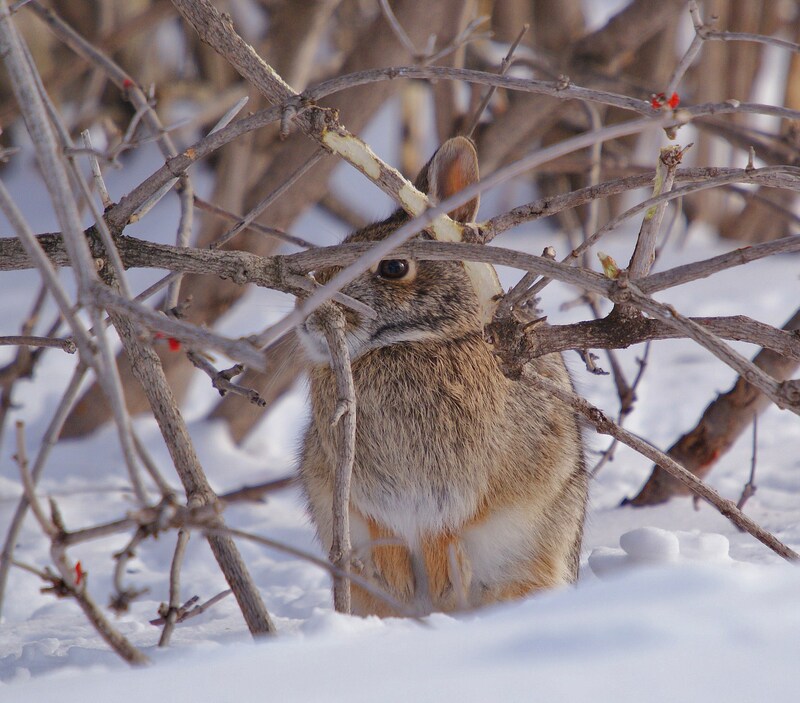 Even throughout the heavy snows and frigid temperatures, this Eastern Cottontail had no problem finding nourishment and sustenance in its small shelter under the highbush cranberry shrubs. It will be interesting to see how much longer this animal sticks around in that same spot; as the snow begins to melt, I’m guessing it will begin to forage farther from the cranberries and ultimately relocate elsewhere in the Arb. Eastern Cottontail still sheltering under highbush cranberry behind Interpretive Center, 2/15/10.